15 mls of alcoholic mountant. Specimens may be mounted straight from alcohol. Als derde kleurstof te gebruiken voor azankleuring. 15 mls of Aqueous Mountant. Specimens may be mounted directly from water. Voor azankleuring van dierlijk weefsel. Keep your specimens moist, preserved and mold free with the same preservative we ship our specimens in. Use to top off your pails or as a humectant. This nontoxic holding fluid contains absolutely no formaldehyde. Instructions for dilution are on bottle. A permanent slide-mounting medium that contains the stain lacto phenol cotton blue. For use with mycology specimens. Produces a long-lasting, permanently stained slide. Upon receipt store at 2 to 30° C. This medium is light sensitive. In 15-mL bottle. Formaldehyde-vrije conserveer oplossing, kan niet gebruikt worden voor fixeren. 1 gram of Congo Red, which is both a botanical and zoological stain. For preparing "Amann" solution for diagnosis of cutaneous fungus. 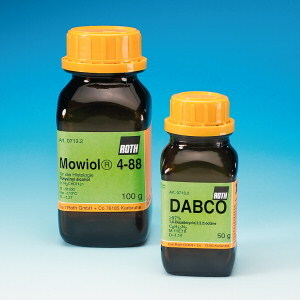 DABCO is an anti-bleaching reagent. It is combined with hydrophilicmounting media as Mowiol, or glycerol in order toconserve the colours and the fluorescence of durable samples. Decalin is a solvent with an intensive smell of camphor, miscible with ethanol, methyl benzoate, benzene and xylene. In histology it is used as clearing agent with the advantage of causing only little shrinking of tissue. 1 gram of Basic Fuchsin, used to stain insect structures and TB bacteria. Acidic Fuchsin is a general zoological stain. 15 mls of Glycerin Jelly containing Basic Fuchsin which stains pollen during the mounting process. 15 mls of Glcerine Jelly, specimens may be mounted direct from water. Semi permanent.